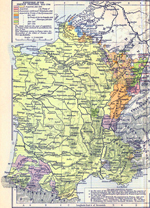 The Treaty of the Pyrenees, also called the Peace of the Pyrenees, was signed on November 7, 1659. French Louis XIV and Spanish Philip IV signed the Treaty of the Pyrenees to end the Franco-Spanish War. This war had begun back in 1635.